Unplugged Worship: Vineyard Music EXTRA! Albums that have a less is more approach. The Vineyard Cafe and Acoustic Worship series fit into the unplugged category. Do not underestimate these albums. They dont have the full sound of a Winds of Worship or Touching the Fathers Heart album, but the passion and intimacy of worship is unmistakable. 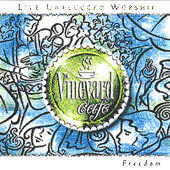 Vineyard Cafe is the more recent series, with about half a dozen musicians playing in a relaxed, cafe atmosphere. These recordings have a cohesiveness and spontanaiety that make them quite special. The older Acoustic Worship series is a little less spontaneous, but has a wonderful collection of classic and newer songs, and is perfect for a quiet time or home group setting. These albums are recorded in front of a live audience, in a more informal setting. Yet the anointing of worship is unmistakable, and the result is an intimate, personal worship time. The Acoustic Worship series is an attempt to capture worship in its purest form: a few people gathered together in a home, worshipping God. The arrangements are simple, using just a single guitar and a piano, and usually a dozen or so voices.